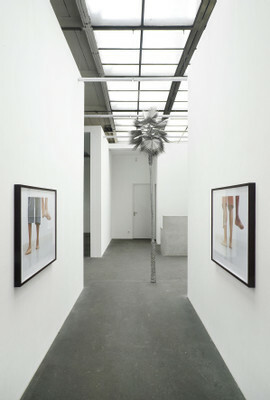 KÖNIG GALERIE is proud to present David Zink Yi's third solo show. 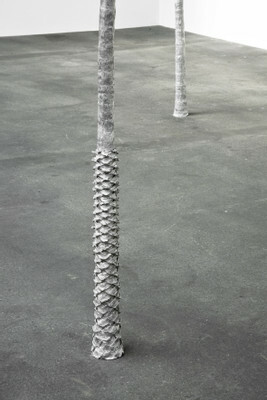 The exhibition consists of sculptures, one 16 mm film and several photographs. As with his earlier works, the concept of identity and its process of development which serves as an access to comprehend his new works. The gallery's main space is filled with a landscape of metal palm trees titled “Neusilber”. 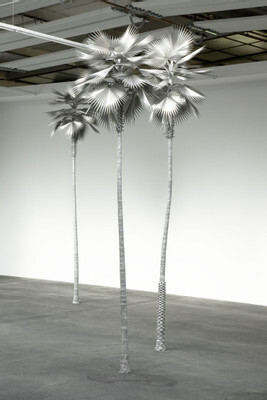 They are finely elaborated reproductions of the palm species “Washingtonia Robusta” in aluminum and stainless steel. This kind of palm is usually found lining a vast number of streets, boardwalks and paths in the southern metropoles of the USA. Instead of skyscrapers, their powerful crowns rise up to 35 m in height into the sky, defining the skyline. 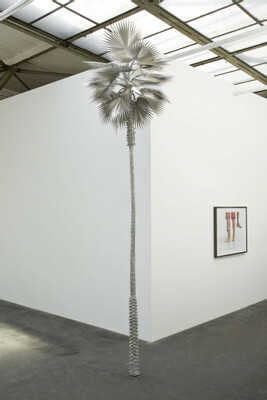 Thus, the palm trees became an icon for Californian cities. The size of the palm trees has been scaled down to about 3.50 meters in Zink Yi's installation, the sharp-edged filigree leaves of their crowns, otherwise inaccessible to people, becoming easily experienced. 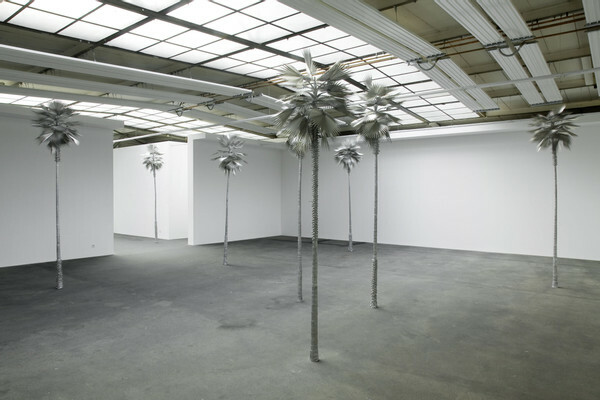 With his installation, Zink Yi generates an atmosphere of cool urbanism between a realism faithful to nature and an idealized artificiality. A single sustained sound can be heard at interrupted intervals in the background. 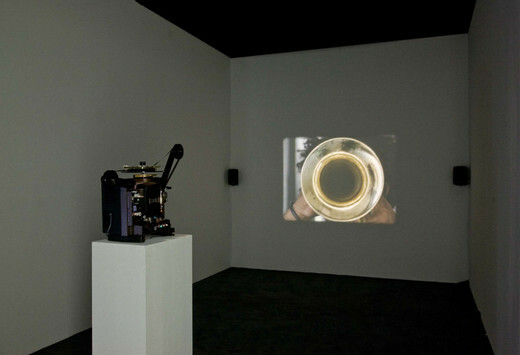 The 16 mm film “Pneuma” features the trumpeter Yuliesky González Guerra, a member of the band present in numerous of David Zink Yi's films. The minute and a half long film was shot in only one take. González Guerra walks from the blurry background directly towards the camera until his face can be seen frontally and in perfect focus. Taking three deep breaths, he places the instrument in front of his face, disappearing behind the trumpet's bell. 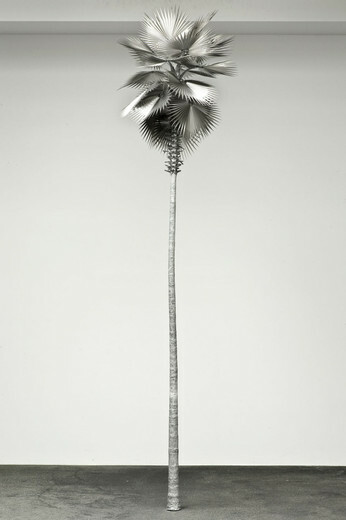 The golden funnel replaces the musician's portrait for about 40 seconds while he holds one single note. The film lasts as long as González Guerra can hold a single note and ends abruptly as soon as he stops out of exhaustion to take a breath. “Pneuma” comes from the Greek language and means “spirit”, “breath”, “air”, but also “breath as the place of the soul and force of life”. The film shown in a loop “Pneuma” thus becomes a symbol for the continuous life and death cycle; the musical note lives as long as one breath and dies with the vital act of inhaling. In turn, the latter is also necessary for the musical note's rebirth. Zink Yi's usage of motifs from his earlier works both in the film as in the photographs makes the effect stronger. Zink Yi does not only reference these works but he reuses its elements in a new way, deconstructing them and allowing them to newly emerge in their changed form. 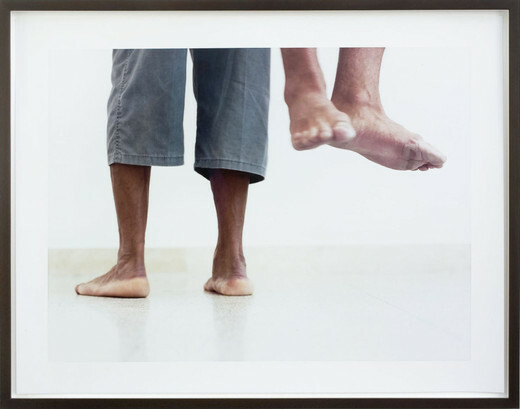 His motifs are ghosts of older contexts, searching for an identity as they are composed in another way or observed from a different angle, or maybe they are just fleeing from themselves.